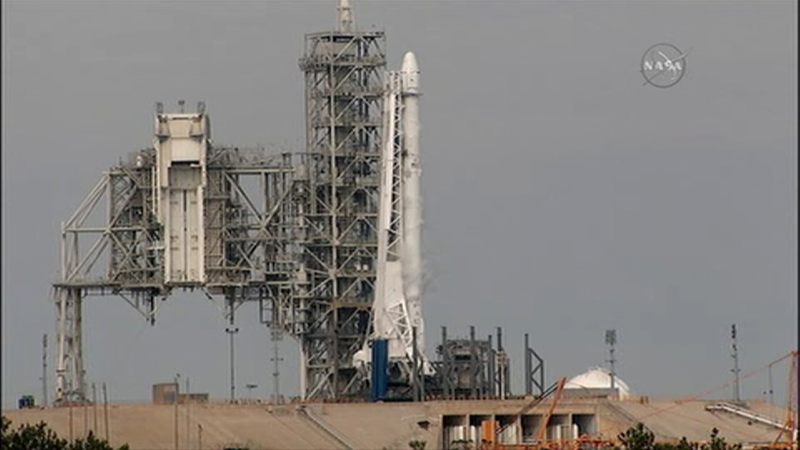 CAPE CANAVERAL, Fla. -- Last-minute rocket trouble forced SpaceX on Saturday to delay its inaugural launch from NASA's historic moon pad. SpaceX halted the countdown with just 13 seconds remaining. The problem with the second-stage thrust control actually cropped up several minutes earlier. With just a single second to get the Falcon rocket airborne, flight controllers could not resolve the issue in time. The unmanned Falcon rocket remains at Kennedy Space Center's Launch Complex 39A, waiting to soar on a space station delivery mission. It's the same pad where Americans flew to the moon almost a half-century ago. Thousands of guests had jammed the space center to witness the comeback of 39A, last used in 2011 for the last space shuttle flight. "Hold, hold, hold!" a launch controller urged over the radio loops, to everyone's disappointment. "Standing down to take a closer look at positioning of the second stage engine nozzle," SpaceX said later via Twitter. The Sept. 1 accident occurred during prelaunch testing at a neighboring pad. SpaceX turned to Launch Complex 39A - which it leases from NASA - to resume flights. The company hopes to launch astronauts from 39A next year. Russia, meanwhile, plans to launch a supply ship to the International Space Station on Wednesday. If the SpaceX mission doesn't get going soon, it would likely have to get in line behind the Russian delivery.